The Sapori world was founded in 1832 by the intuition of Virgilio Sapori, a well-known Tuscan apothecary, who saw in his laboratory the ideal place to start creating a real taste workshop. Today, as then, the best raw materials blend with the Tuscan passion and art of pastry making in a constant search for excellence and the ability to renew and reinterpret tradition. 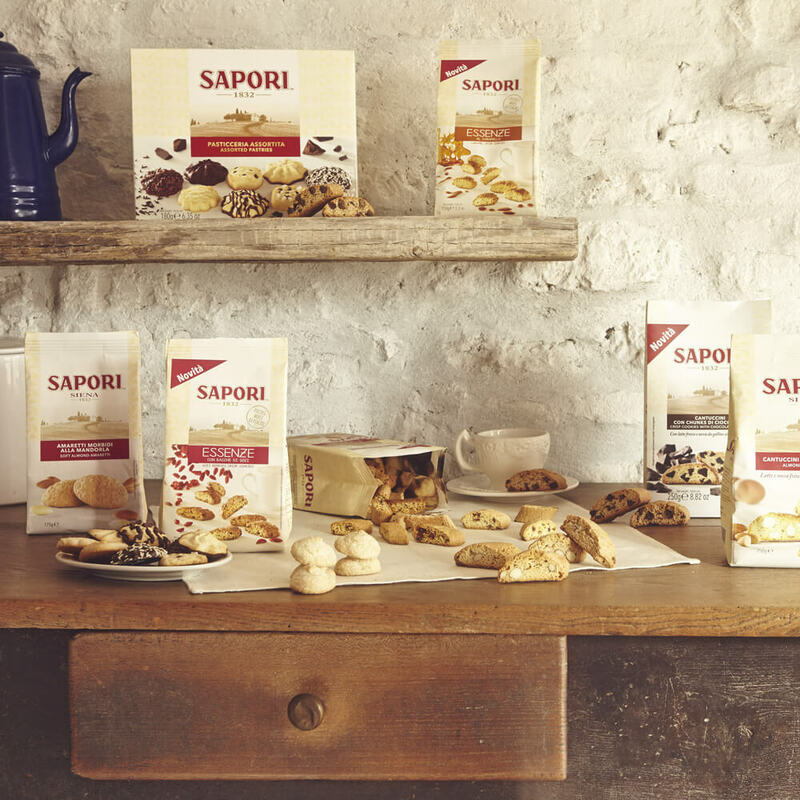 The profound passion of Sapori for its territory has allowed it to transmit all the excellence of the ancient Tuscan recipes into all its products. Since 1832 a lasting union. How was Panforte Margherita born? In 1879, the Sienese pharmacist, Galgano Parenti, owner of one of the city's leading bakeries, had created a new version of panforte. He later joined the Sapori family to develop together the Sienese sweets for the world. The novelty consisted of a layer of powdered sugar that made it more delicate than previously. He dedicated the new recipe to Queen Margherita di Savoia, who was visiting Siena for the August Palio, and from that day the panforte took its name. She liked the kind gift so much that her knight of honor sent a heartfelt thank-you letter to Galgano, still jealously guarded by us today. Our history has ancient origins in a now distant time… a curious Tuscan pharmacist, Virgilio Sapori, saw his little spice shop as the ideal place to package a typical local sweet made with honey and spices: Panforte, which is still inextricably linked to the recipe of 1832. Virgilio decided to continue his work, not limiting himself to Panforte, but also devoting himself to Ricciarelli, the curled sweet made from almond paste with a crunchy crust, whose origins are still debated. It is said that Ricciarelli are descended from marzipan, which was already used in the 1400s for making cakes, while the same paste was used in Siena to make tiny “marzapanetti” biscuits. 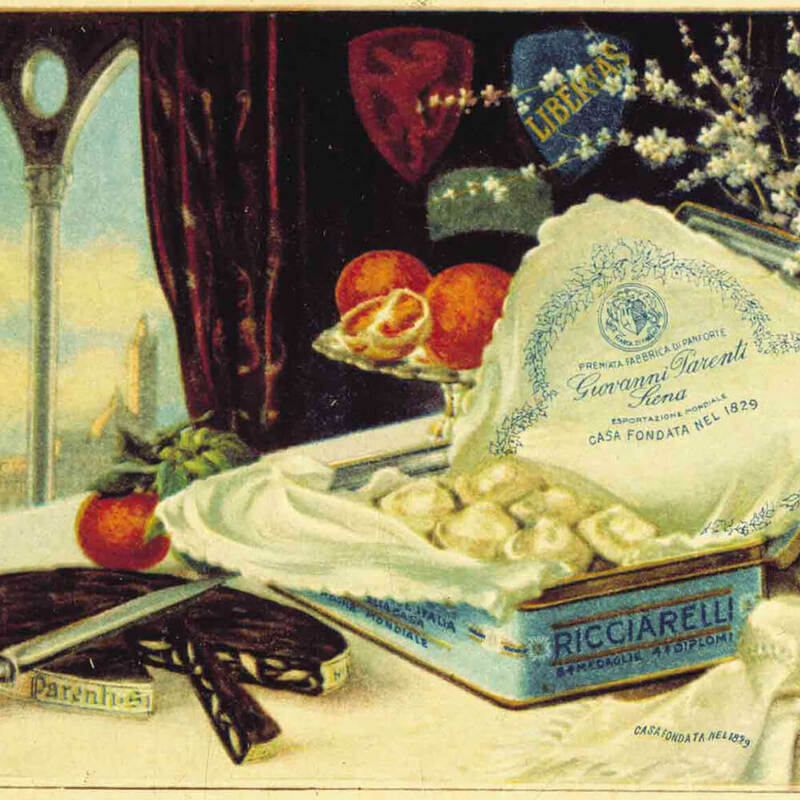 According to legend, the first to introduce Ricciarelli was Ricciardetto Gherardesca, on his return from the Crusades, who told of unusual foreign sweets, curled like sultans’ slippers. But whatever the origins and legends, Ricciarelli are still soft sweets with the delicate aroma of Tuscan tradition. 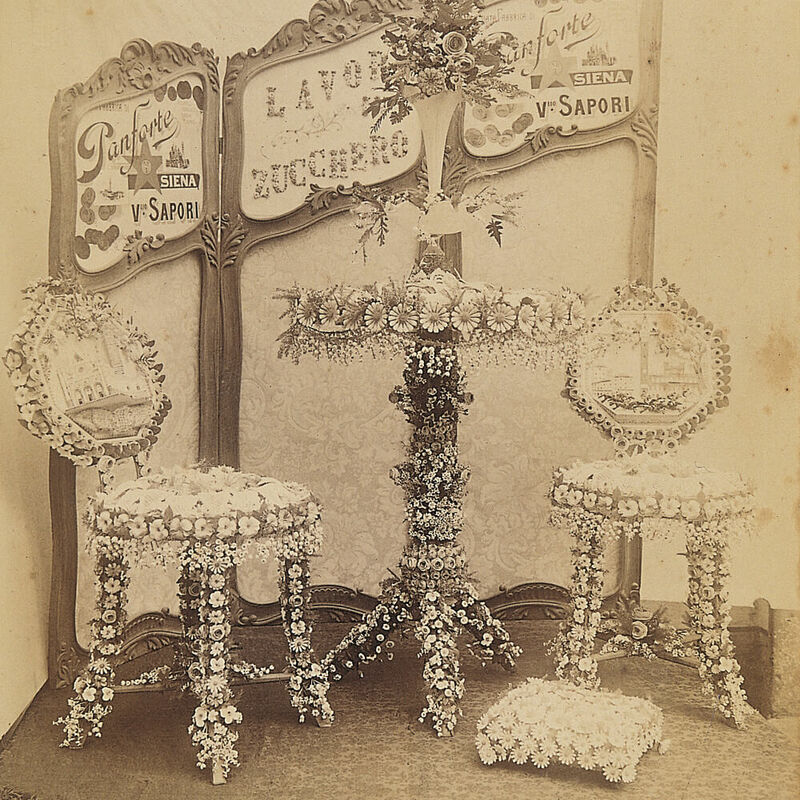 In 1900, Virgilio’s son Dante offered his traditional sweets at the Universal Exposition in Paris, in a small, tidy space. The international dimension of Sapori products, moreover, was already largely determined, as the company was founded on the Via Francigena, the road used by thousands of pilgrims traveling to the holy places of Christianity, as well as the scene of intense trade. 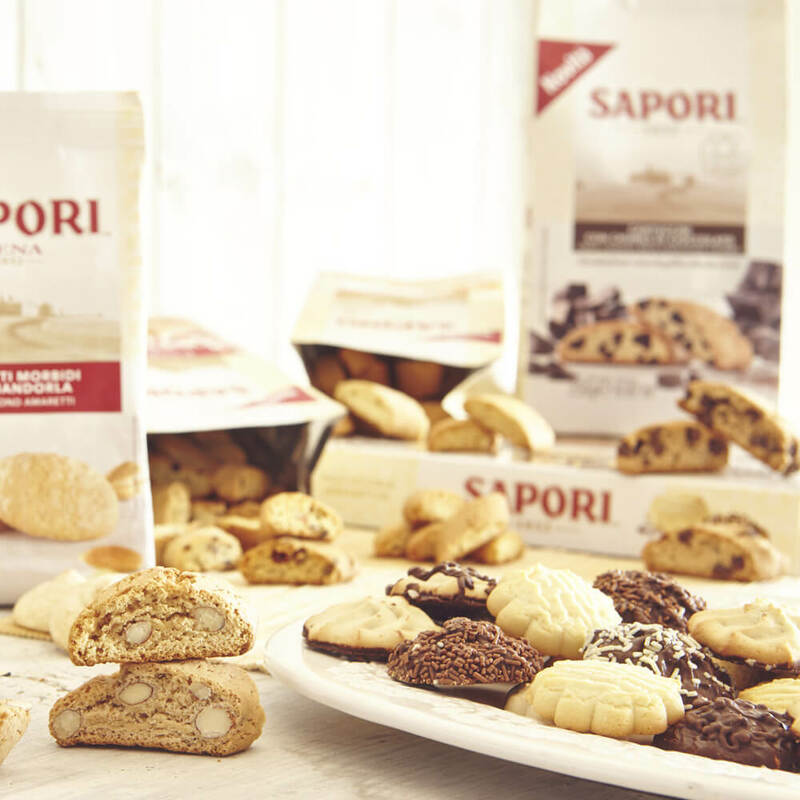 Since then Sapori has continued to attract foreign consumers, by distributing its products abroad and participating in food trade fairs. In 1944 the Sapori premises near the train station were unfortunately destroyed during a bombing. The situation was very difficult, but nevertheless, refusal to surrender even in the face of the worst events, and confidence in the future, brought a rapid revival. 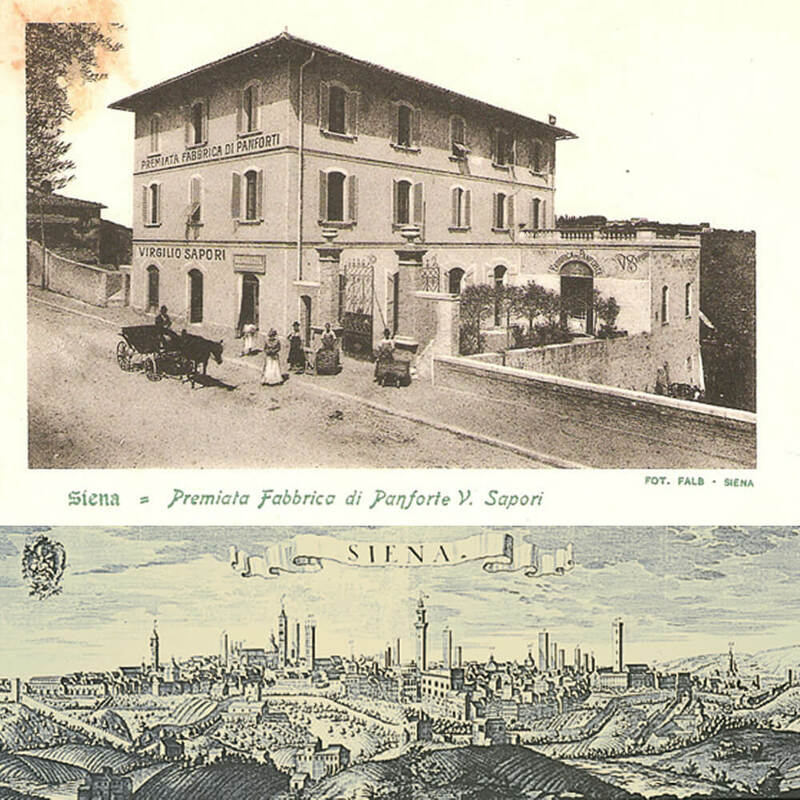 The new factory was evidence of the Sapori company’s technological and merchandising progress, with the introduction of new product lines such as biscuits, nougats, candies, Christmas and Easter cakes and chocolate. 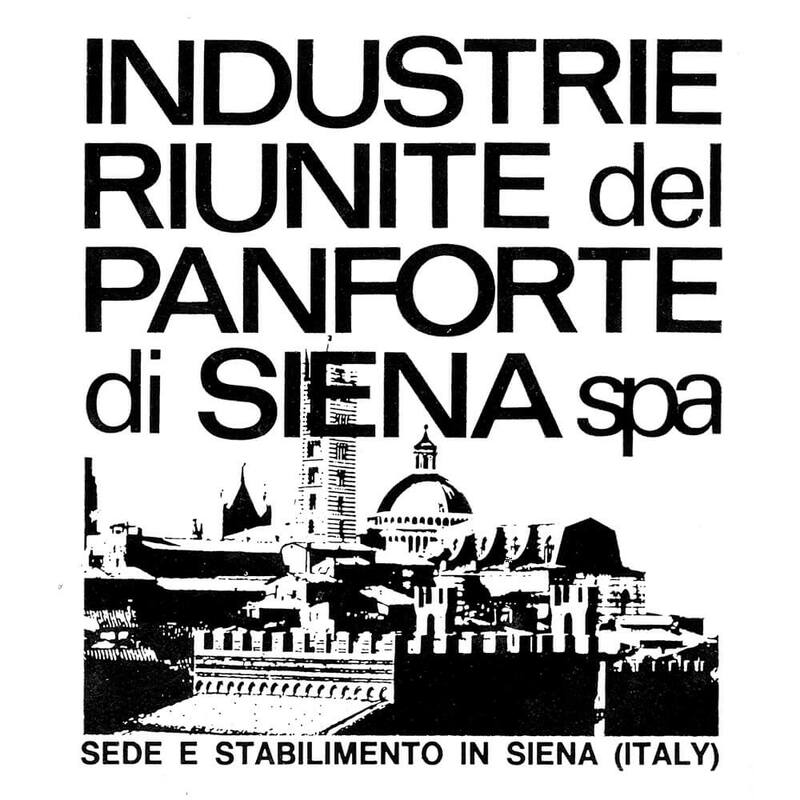 Technological development, merchandise diversification and the commercial growth of traditional Sienese products gave rise in 1956 to Industrie Riunite del Panforte di Siena. 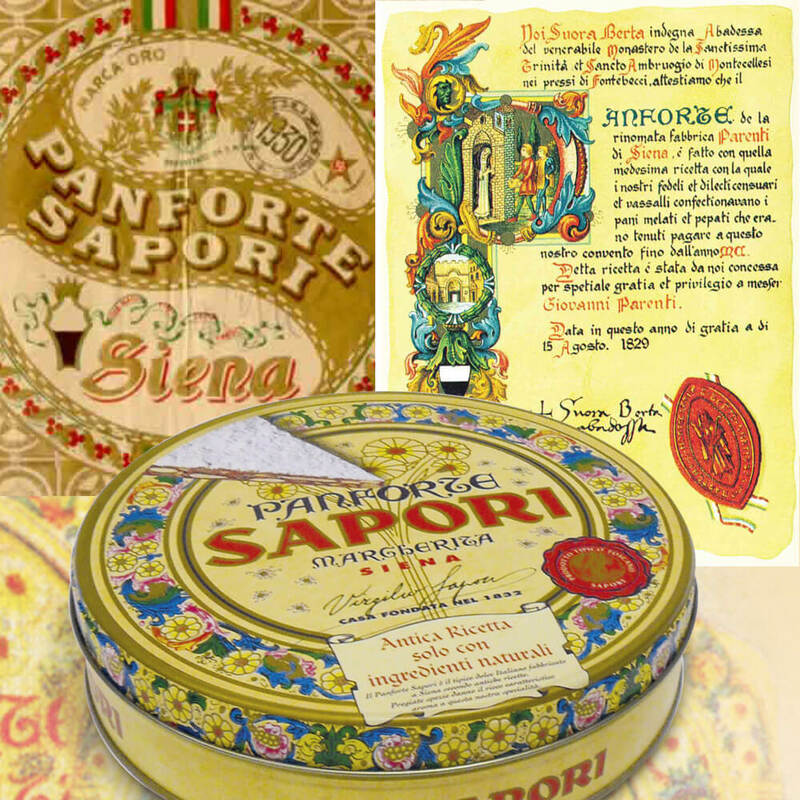 The strategic plan was to bring together and promote leading brands of Panforte and other Sienese sweets. Sapori immediately became the mainstay, setting up more locations across Europe and allowing entry to major international partners, including J.Lyons and Allied Breweries Limited between 1972 and 1980. It was at this time that the famous octagonal Panforte box was born, replacing the old hand-wrapping. 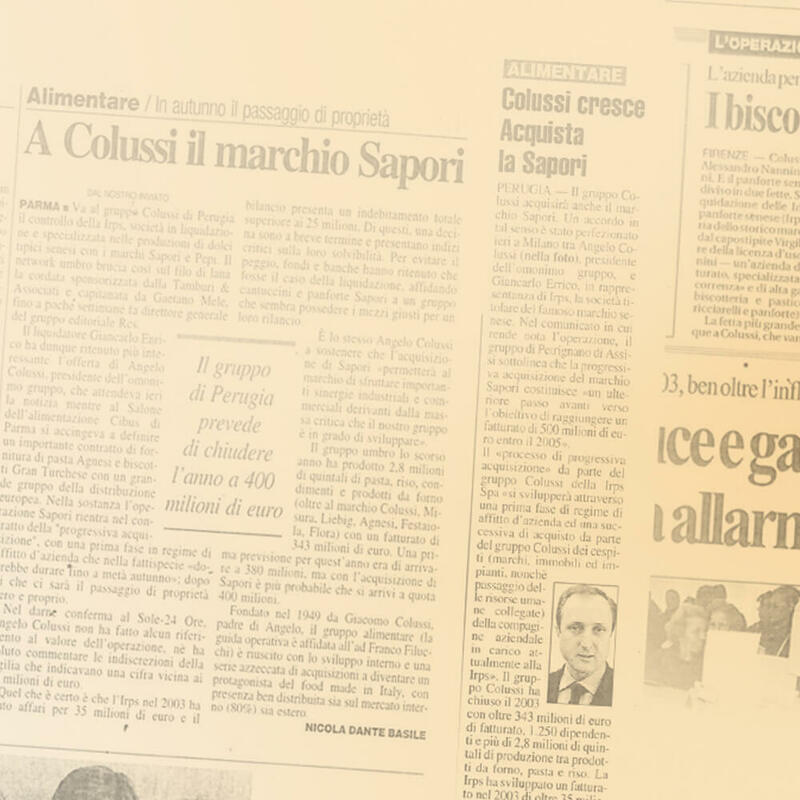 In 2004 the Sapori brand was bought by the COLUSSI GROUP, creating an important commercial and strategic synergy; Tuscan products and the image of Siena began to be developed worldwide. What still makes us unique is the link to an ancient tradition, always respected, and the passion in processing raw materials. After re-establishing Sapori’s identity as “Confectioners since 1832”, 2014 marked the moment when the product itself became the star, with beautiful images that placed it in the foreground along with its raw materials. The choice was to convey the excellent quality that distinguishes the brand in the best way, renewing a pact of confidence with consumers. Sapori renews its promise and continues to convey it through its products. 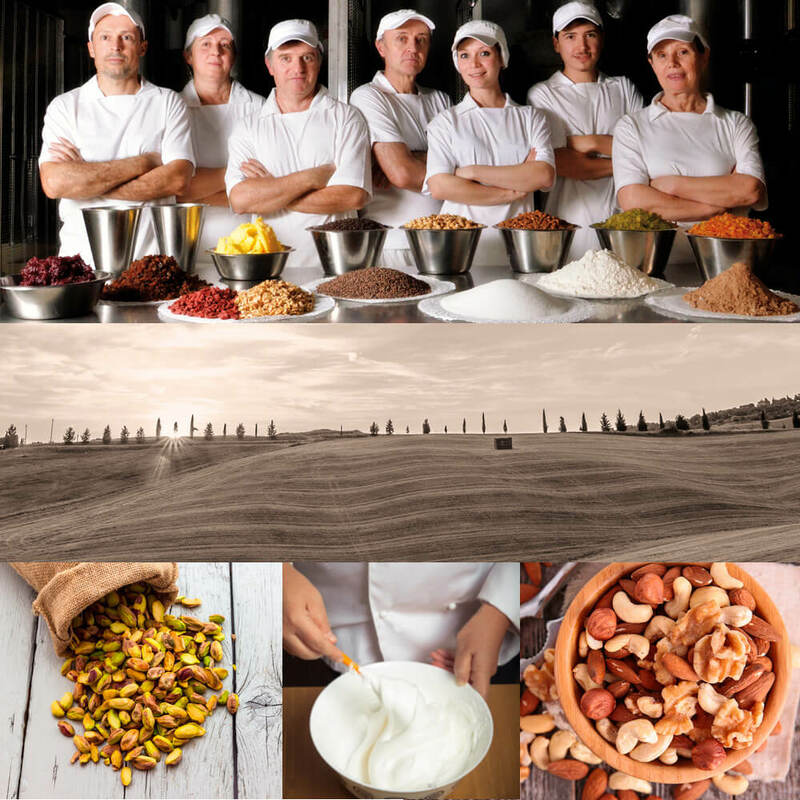 We want to offer high quality products, based on the choicest ingredients and respect for tradition. The passion of working with the ingredients, the quality of the raw materials, and the link to ancient Tuscan traditions are symbols of a brand that continues to grow but does not forget its roots. In 2016, Sapori took another big step towards the enhancement of the ingredients it uses and the strong link with its territory, thanks to the collaboration with the University of Gastronomic Sciences of Pollenzo and with the Slow Food. In this way, attention to people, the continuous search for excellence and the spread of a new awareness of food have become the values that guide Sapori every day.